This time last year I had a first draft of the rules of Zombology, but due to various things I'm not quite so organised this year, but here's what's in my head at the moment. I'd appreciate any feedback on the ideas, what you think might work well or what badly and anything you think I've overlooked. This week we're having our house double-glazed, so I imagine I'll be spending most of my free time cleaning up whichever rooms have been trashed during the day. Also my father-in-law is visiting shortly. I'm hoping to make it to Newcastle Playtest on Tuesday, though I won't know until after Monday's clean up how viable that is. It's a two-player card game about the showdown between St. George (patron saint of England and a bunch of other places) and the dragon. It's a Good Little Game, so 18 cards, some counters representing George's hit points and the dragon's hit points and some dice (a few for each player). One player plays St. George, he has nine cards, a few hit points and several (4? 5?) dice. The other player plays the dragon, with more hit points, but fewer dice (3? 4?). 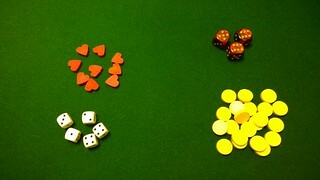 At the beginning of the game both players roll all their dice. Then each round both players simultaneously choose a card (representing an attack, defence or movement) and optionally a die. Once chosen, both players reveal their chosen card, action them and then discard them and any die they chose. The cards represent attacks (which do more damage for high die rolls), defence (which work better with low die rolls), movement (between long and short range) and a recoup card which lets you draw back the cards from your discard pile to your hand and re-roll all your dice. The game has two ranges, long and short. At the beginning you are at long range. 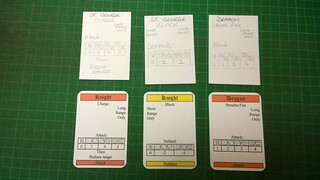 Some attack and defence card only work at long/short range and the ninth card that both players have is a double-sided cheat sheet showing which cards work at the current range. Each player has cards that let them move from short to long range and vice versa. If one player advances and the other retreats they stay at the same range, if both advance they are at short and if both retreat they are at long range. If only one player moves then the range changes as appropriate for the card played. First player to run out of hit points is slain by their opponent. Can only be played at short range. Can be played at long or short range. Obviously, I'm going to have to play this a lot to adequately balance it, but what are your first impressions? Any ideas? Want to help test it when the files and rules available? There's PIPs in it! Last year I took part in (inter-)National Games Design Month (or NaGa DeMon for short): during the month of November you are challenged to design a game. It's extremely unlikely that you'll be able to make a decent quality game in only a month, but like its fiction counterpart NaNo WriMo, the idea is to get a first draft completed. Last year I worked on Zombology, a drafting card game that has ended up being my main focus in the months since I 'finished' it during last November. I was very keen initially to take part again this year and then umm-ed and ahh-ed a bit as various impediments appeared in my calendar in November, but some of them have disappeared and I've finally come down off the fence on the side of taking part. Yay! My focus this year will be Codename: Dragon - a 2-player card game about St. George and the Dragon. It'll be a game of bluff and simultaneous action selection with dice and only 18 cards (so fitting with the Good Little Games ethos). Which makes it easy to test (I only need one playtester) and easier for others to print and play. I'll be posting the rules here along with print-and-play files as I make them and would really appreciate your help in testing and refining the game. As with last year I'm going to run the game within the game (TGWAG) to encourage you, my internet audience to take part and help me make progress in the very short timespan available to me. 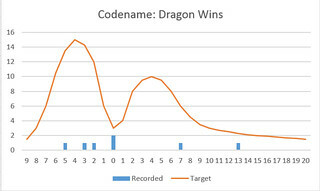 During TGWAG I award Pointless Internet Points™ to people who help out and at the end of the month the three (down from five last year) people with the highest PIP totals will get a free copy of the NaGa DeMon version of Codename: Dragon, signed and numbered by my good self. Though probably not until January, if last year is anything to go by! I'll be awarding PIPs to people who help me out by promoting the game or the TGWAG competition (e.g. retweeting my tweets, Google+ shares, etc.) or proofreading the rules that I post here, or giving me ideas or suggestions for new rules or mechanics or, most importantly of all, for printing out the print and play files and actually playtesting the game for me and providing feedback on what you liked and didn't like. Interested? Sign up in the comments below and start your arduous journey to Patron Saint. 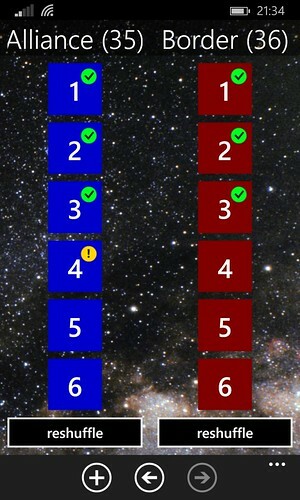 In other news, this week was mostly testing and releasing an update of my BGG Last Plays app. It now supports loading over close/restart, landscape support and sideways scrolling of the game name for games with longer names. 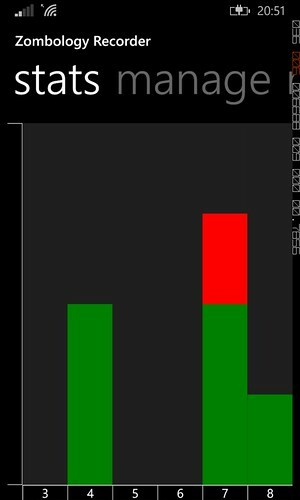 Plus a couple of minor UI tweaks and fixing a crash found four times by various users. In yet further news, my latest Windows Phone app (a super secret, unlicensed board game app that I've been developing as a training exercise and for my own amusement) has been approved by the physical game's publisher. So I now need to get it finished off so that I can add it to the store. It's approved for non-commercial use, so like my other apps it'll be free and ad-free. It's been a busy week with, thankfully, a boat load of gaming. During the week I got to playtest my secret game app with some friends, which gave me some great new ideas for improving the UI (plus revealed a bunch of bugs I'd not found by myself). Thursday lunchtime we played a couple of 3-player games of Zombology, and despite my fear that the new version (with the ability to hold over a card each round) was too easy we managed to lose both, so the 3-player win/loss ratio for this version stands at 1/2 which to my mind is about right! I still need to make some changes, but maybe not as sweeping ones as I first thought. My November has also resolved itself. I had been hoping to do NaGa DeMon again, but with the major work being done on our house slipping back into November and my parents planning to visit for a week during November (both during the week of Newcastle Playtest, effectively ruling that out) it was looking like I'd really struggle to make enough progress to make it achievable. My parents have now delayed their visit to the start of December, so I think NaGa DeMon is go again :-) I've an idea for a game I'd like to try to make (Codename: Dragon that I mentioned at the end of last year), and I'll run TGWAG again. To top the week off in style we drove down south to spend the weekend with my mate Tim and his family. Tim and I go way back, so it's always good to catch up and spend some time playing with our families, plus Tim and I get to game late into the night (or at least what I call late, so gone 10!). This weekend was no different we played lots of games during the day with Tim's son (I was whooped at a surprising number of games by a six-year old - clearly I'm not quite as bright as I like to think! ), and then in the evening we played a game Tim is designing, then Thunderstone and finally Tim and I played Firefly until just gone one am. It was a great weekend and Firefly came in around 2.5 hours with the two of us, despite Tim not having played before. Tim and I spent most of the weekend talking game publishing. Tim's game is coming on really nicely and he's considering KickStarting it. By day he writes computer games for a living so he's got a great understanding about what makes a good game and he know loads of great artists. (As an aside RH Aidley who did the art for It's Alive! and Carpe Astra for me and also Ice Flow for Ludorum Games is someone I met through Tim). Tim wanted to ask loads of questions about the process of publishing a game, so I got to hold forth, wittering on about my experiences with Reiver Games and what little I know about KickStarter. I wish Tim all the best with his game (and now have a copy for playtesting :-) ), but I'm still not sure if I'd want to go back into publishing if ever I consider one of my designs ready for the world. Still, it reminds me that I know a load of contacts and still have a bunch of knowledge about the process and finances of running a game company. I hope I can use that knowledge to help Tim out. After several weeks of very little progress on my games design while I focussed on app development for my phone instead, I've finally had a good week of game design progress. It got off to a good start on Monday night, when I printed out the latest version of Zombology, which has sat on my hard drive for several weeks if not a month waiting to see the light of day. There were a couple of problems I spotted after printing that I didn't have time to correct, but I'll fix them up before the next version. Tuesday was the October meetup of the Newcastle branch of Playtest UK. With new Zombology in hand we started off with a couple of games of that - it's becoming a habit to start with Zombology as it's short and supports lots of players so we can play a couple of games of it before splitting into smaller groups for other games. We tried the new rules which I mentioned a couple of weeks ago, and as I feared at the time, they require more changes to be made. Opinion on the new rules was split with Dan and Paul preferring them and the others either on the fence or preferring the old rules. With twice as many decisions to make and the ability to hang onto a card you definitely felt a lot more in control, but the downside was that the Cure cards were all hogged in the second half of the game, so the initial deal was more important. Either way, the new version was way too easy for the players to win, so I'll have to address the card balance if I continue with the new rules, as well as come up with something for the Cure-hogging possibly. After Zombology we split up and I got to play 54 Jones, Paul's game about Sci-Fi Sewer Surfing Cleaner Clones. As ever it was very entertaining, and this version was the slickest I've played so far. Then we played another Zombology (with Alex who'd missed the first two games) and then a couple of side-by-side Border Reivers, using the bits from the four players limited edition to cobble together two two-player games. Paul had played the limited edition rules last month, so this time we all played some of the ideas I've had for a new version. As is to be expected for a first play, it was pretty unbalanced, so I've got a bunch of changes to make before I play it again. Thursday lunchtime we got a couple of games of Zombology in (three and four player, so I've now played this version with 3, 4, 5 and 6) and yet again they were player wins, further convincing me that it needs tightening up again. Finally on Saturday I made it to Newcastle Gamers for a few games. 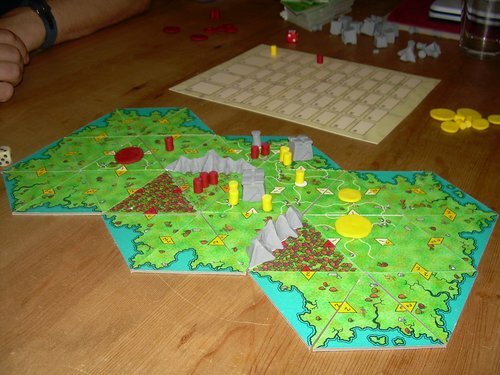 We played Trains (new to me), Carcassonne the City (on my list of games to play this year) and Love Letter. Trains was suggested by Olly as something a little like Codename: Vaccuum that I might want to play for research purposes. As it turns out it gave me some new ideas. On top of all of this, I've been cracking on with my board game app on my phone and I really ought to put out another update to my BGG Last Plays app to fix a crash reported in the wild and a couple of minor things suggested by friends. Yet another week of no real game design progress. Thankfully, all that is about to change. It's Newcastle Playtest again on Tuesday and it looks like it's going to be a busy night - three new members have signed up via Meetup. I'm going to spend tonight finally making the new version of Zombology I talked about several weeks ago, so it'll be ready for Playtest on Tuesday. The only differences to the components are replacing the three remaining serious scientific suits with ridiculous ones and smartening up the art a bit in the places where I hadn't got round to it in the previous version. 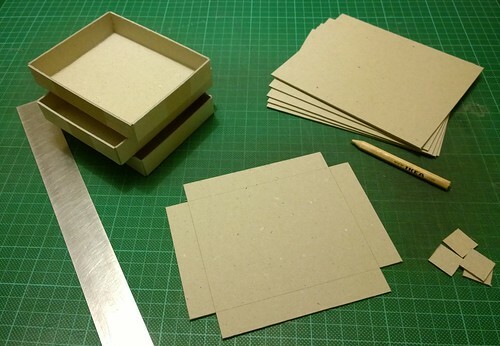 I've also got the new idea I had last week to try out too. 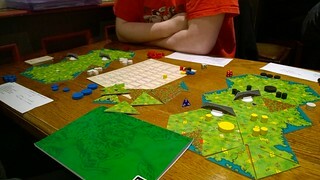 One of the critics of the current version is Paul Scott from Newcastle Playtest. He's another person who finds it too random - a problem the new idea will hopefully address. I'm looking forward to hearing whether he, in particular, prefers the new version to the old. It's been a few weeks since I last played Zombology, it'll be good to make some more progress on it once again.